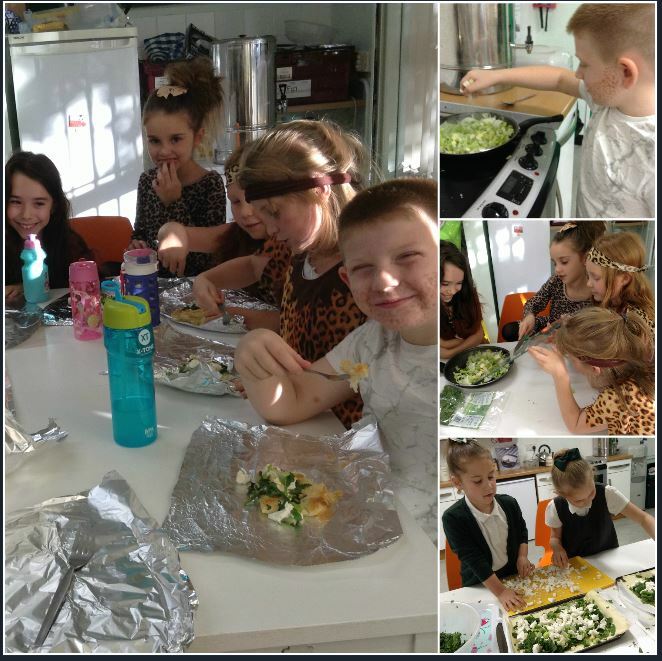 Last week, we made stuffed peppers and garlic bread! First we cut the peppers in half and scooped out the seeds. Then we drizzled them in oil, salt and pepper and put them in the oven to roast. While the peppers were cooking, we added a vegetable stock cube to some water to dissolve and poured this over cous cous until the grains were covered. This was left to stand for 10 mins. We then mixed olive oil with the garlic we had grated and drizzled it over bread slices. We popped these under the grill to toast. 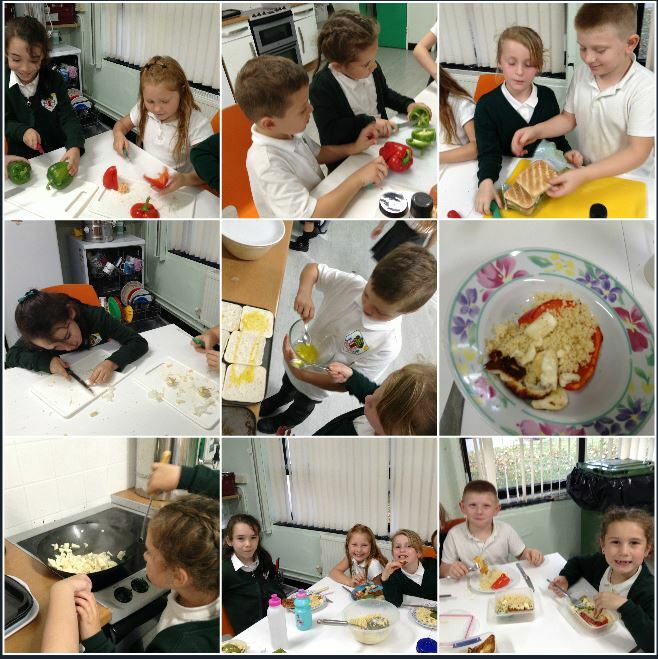 Once the peppers were ready, we stuffed them with the cous cous and topped with halloumi cheese which we ‘dry fried’ in a pan. We were pretty happy with our results! This week, we made a feta pastry. Preheat the oven to 210C/gas mark 7. Finely slice the leeks and rinse well under running water. Heat a little butter and oil in a saucepan and fry the leeks over a low heat with the crushed garlic and dill. Cook gently for about ten minutes, covered with a lid, until well softened but not coloured. Season well with salt and pepper. Wilt 300g of spinach either in the microwave or in a covered saucepan with a little water. Once wilted, tip into a sieve or colander and squeeze out as much liquid as you can. Spread the cooked leeks and spinach over the base of the pastry, keeping within the border. Crumble the feta cheese over the top of the vegetables, filling in any gaps. Season with a little more pepper and brush the edges of pastry with a little milk. Bake for 15-20 minutes on the top shelf of the oven until the pastry edges are risen and golden and the feta has started to brown.